What was the best time and place to be alive? Making his own choice of the best time to have been alive, Edward Gibbon, author of “Decline and Fall of the Roman Empire” (1776-89), didn’t have much doubt. “If a man were called to fix the period in the history of the world during which the condition of the human race was most happy and prosperous, he would, without hesitation, name that which elapsed from the death of Domitian to the accession of Commodus.” This was the second century AD, when Rome’s “five good emperors”, Nerva, Trajan, Hadrian, Antoninus Pius and Marcus Aurelius, brought a peace and stability that western Europe would—in Gibbon’s view—never see again. But maybe it was an easier question then. Gibbon was white, smart and male. He could walk from the right end of one hierarchical society into another without a tremor. Nor was he sacrificing much technology to do so. Barring gunpowder and the printing press, his world and Hadrian’s were close enough to let Gibbon swap breeches for a toga and barely notice the difference. For us, the question needs a little more thought. Anyone who dislikes pain, prefers their operations under anaesthetic, and has no wish to die of smallpox, might well choose to live now. We can balance that by awarding ourselves perpetual good health, but it’s harder to level the playing field when it comes to gender. Not many modern women, however frustrated with their lot, would choose to go back to long skirts, tight corsets and a general assumption that they are stupid. The same may apply to any European who isn’t white, and to anyone in the less affluent three-quarters of society. My children once went on a school trip to Apsley House, the Duke of Wellington’s home. I thought they were going to learn about lords; instead they were taught what it was like being a servant. Transport most of us to ancient Rome and we’ll find ourselves in a poorhouse or slave barracks. To give our question a chance, we have to assume that we can do our time travel, if not first-class, then in premium economy, switching genders if we feel like it, to land somewhere moderately comfortable. This isn’t a question about technology, where the present will always trump the past. It’s about lifestyle and ideas, people and manners, things that ebb and flow. Armed with a passport to the good life in a time and place of our choice, not many will pass on the journey. Culture-vultures will book their seats in Shakespeare’s Globe in 1599 or the Cotton Club, Harlem, in the 1920s. Hero-worshippers will queue up to watch Michelangelo chisel stone in 1501 or Genghis Khan ride into battle in 1206. Epicures, the most prudent time-travellers, will follow Gibbon to Rome, or time their birth to dodge a call-up for the world wars and surf the Pax Americana. Peace and stability are all very well, but several of mankind’s giant leaps have come in times of war. Democracy got going, and conversation buzzed, in Athens in the fifth century BC, with the Peloponnesian war raging outside. I’d brave the 16th-century Wars of Religion to catch the Reformation, or the Thirty Years War (1618-48) to watch the Enlightenment dawn. What I’m after is a sense of possibility. There’s a striking moment at the start of Thucydides’ “Peloponnesian War” when he surveys Greek history up to then. The striking part is, it only lasts a couple of pages. History is still on Series One. And maybe that sense of freshness is why the present doesn’t hold all the cards. Our own excitement in the rich, free West seems to have leaked away. A third of us can’t be bothered to use the votes Libyans are dying for. We have freed slaves, empowered women, shaken off tyrants. We should be living happily ever after, yet we’re not. Reason enough to tack against time and find a place where the future hasn’t gone stale. It’s tempting to go by what you might witness—Socrates arguing with Plato in Athens, their contemporary Confucius riding through China, or Julius Caesar tangling with Cicero in 50BC Rome. But that would just be time tourism. Part of the challenge is that we’re not just looking for a single charismatic moment. Places exist in time. What have the old people seen? What’s in store for the children? We’re looking for a turning point, a place living through changes whose effects are with us still. 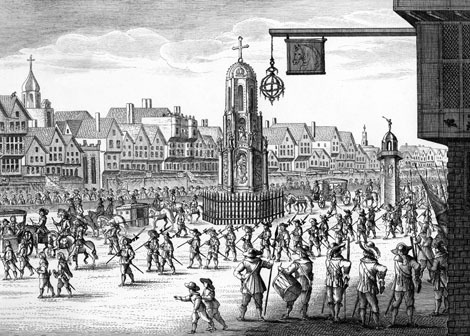 Which brings us to London in the 1690s, just after the Glorious Revolution that drove James II from his throne in a coup led by Prince William of Orange. This London has a back story as rich as its potential. Its old people might have shaken the hand of Shakespeare, as well as surviving two civil wars; their grandchildren will die in the capital of a global empire. Around them, a whole new world is taking shape. At Jonathan’s coffee house, you can watch the stockmarket being born; insurance is being invented at Lloyd’s, and the new Bank of England is laying the foundations of national finance. Walking down Cheapside, you can buy an uncensored newspaper or stop to pray in a chapel of your choice. Your father couldn’t do either. Parliament has just begun a continuous tradition of government that will last for centuries. In the bookshops around Westminster Hall, you can buy Isaac Newton’s “Principia” warm off the press, as well as economic texts that talk for the first time about supply and demand, the way money isn’t fixed in value, and why credit matters more than gold. And you may well understand what they are saying, because enlightenment disciplines are still young and connected enough for a generalist to grasp. Leisure is thriving in 1690s London. Pleasure gardens are opening and French food is all the rage, swept in by Huguenot immigration. You can go to the first night of Vanbrugh’s “The Relapse”, or Purcell’s “The Fairy Queen”. Coffee houses are packed and the craic is good: the age of wits such as Steele and Addison is dawning. Fashion has arrived, and the Strand is full of luxury shops whose display windows are a novelty, as are most of the things they sell. Best of all, the walk across town takes far longer than it took your father because this is becoming the first monster metropolis. “When a man is tired of London, he is tired of life,” Samuel Johnson said 80 years later. You can watch his sparkling city take shape. No one is celebrating yet. People are saying there’ll be another coup and the newfangled stockmarket will crash again. That’s all part of the charge. Things are happening in London—tolerance, freedom of the press and parliament, consumerism, scientific breakthroughs, economic transformation—that millions of people will still be benefiting from 320 years later. In the coffee house, they talk of the new mathematics for calculating probability. That’s what the insurance market is about, as well as the gambling craze that’s ruining aristocrats all over town: a whole new engagement with possibility, an understanding that the future isn’t going to be like the past. And that’s what draws me to London in the 1690s, despite the wigs, the quack doctors and the stink of coal smoke. The modern world is starting, and I want to be there.